Jamie McNear sings while his band performs at the Chop Shop in Wicker Park on Aug. 11, 2017. McNear is the lead singer of Manwolves, an Evanston band that was streamed for over 10 million minutes on Spotify in 2017. Manwolves, an Evanston band, formed only a few years ago, but in 2017 people listened to their music for more than 10 million minutes on Spotify. 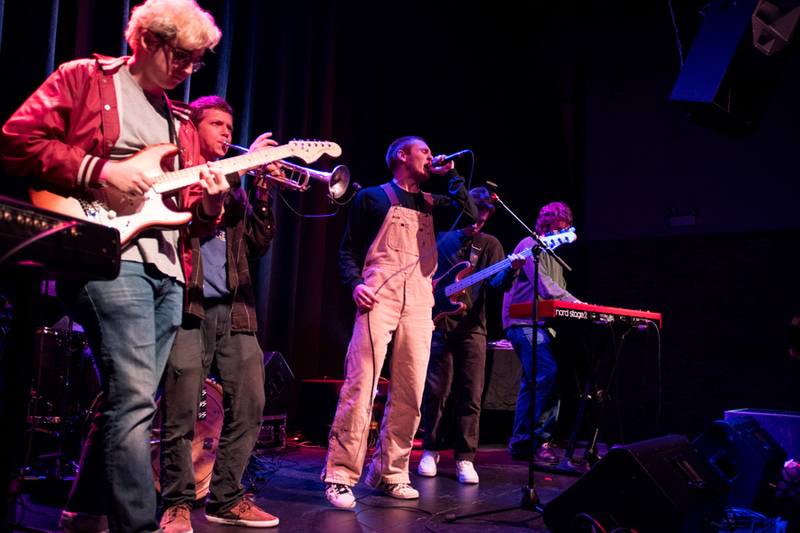 The band’s six members — Jamie McNear, Ari Garfin, Henry Wolf, Julian Freeman, Eli Cohen and Michael Werner — are all recent Evanston Township High School graduates. They all met at ETHS or Nichols Middle School in Evanston, Wolf said. Wolf said that the band members were friends long before they worked together. The name “Manwolves” came from lead singer McNear, whose mother told him stories about a man-wolf, he said. Wolf added that the band members — two of whom still live in Evanston, with the rest in Chicago — now work in the band full-time. They don’t have a daily routine, and could be rehearsing, writing or doing other things on any given day. The band has performed all across the Midwest, including playing shows in Wisconsin, Minnesota and many appearances in Chicago, according to the group’s Instagram. Recently, Wolf said the band has focused on working on new music, so they’ve been in the studio more often. Garfin, who plays the keyboard, said the band writes and performs their own songs, combining genres like jazz, rock and hip hop to produce the band’s sound. He added that each band member writes his own parts. The lead singer writes the lyrics and the band does all the instrumentals, he said. Freeman said they never planned their music to be any sort of way, adding that the band’s music came together because it combined everyone’s tastes. They occasionally play covers, but add their own “Manwolves flair” to them, he said. Garfin said the band’s music can be found on music streaming sites; several singles have been released on Spotify. Freeman added that their rising popularity can be attributed to maintaining support from a loyal fanbase, getting noticed by influential sites, releasing and promoting content and putting their music out to other places in the world. Freeman said he thought Spotify noticed them because of their early popularity. Spotify then placed the band on some of their bigger playlists, like the United States Viral 50 — where they were No. 4 for a while. The band also trended on “r/listentothis” on Reddit, he said. Their listeners include people from all over the country, including Los Angeles, New York City and Houston, according to their Spotify page. Garfin said that he’s excited to keep working to grow what the band already has. The band is always looking to improve on themselves, he added. Freeman said he would like the band to have a lasting, positive impact on people. “I would like the band to be remembered as six good guys that made good music that affected people in a positive way,” he said.